Sri Lanka looks like a large drop of water, or an avocado slice with a yellowish core (that is the mountainous part of Sri Lanka), and green edges. The region stretches 270 miles in length and is 150 miles wide and is reminiscent of India. However, I find it to be a bit cozier, cleaner and slightly richer (you will rarely notice any beggars along the roads). A month ago, I took a whirlwind trip to Sri Lanka, a place of unbelievable beauty and peacefulness. Located cozily amidst green mountains, Kandy is a stunning city. The last bastion of the Sinhalese dominion prior to the British took control of the entire island in 1815, the city has been able to sustain much of its culture and traditions and is known as the cultural capital of Sri Lanka. You will discover an interesting mix of the Kandyan style of living, blending in with colonial buildings and roads. The streets are neat, and there is a whiff of freshness in the air–you’ll instantly like the city. How to get there from Colombo? Since I am based in Dubai, it’s easy for me to move around. There are three different ways to get to Kandy from Colombo including by train, car & bus. Since the Sri Lankan train is very comfortable and easy to catch, I decided to go by train. Read about my Colombo to Kandy train trip experience here. This is the place where you should start your Kandy trip. 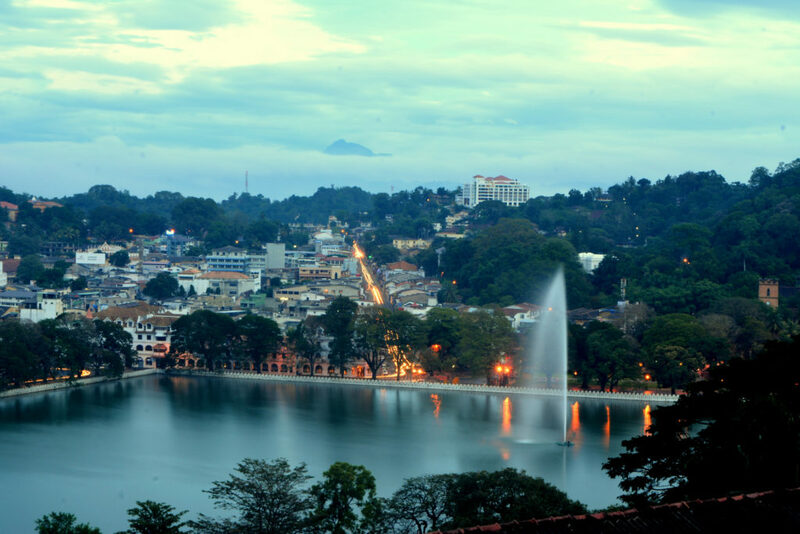 Kandy lake is located in the middle of the city and adds some quietness to the hurly-burly surrounding it. I found interesting bird life, great photo opportunities, and enjoyed walking around experiencing the local atmosphere. After getting back from Kandy lake, I visited the Botanic Garden which features various unique plants but I got caught up photographing animals. I even got very close to a snake. She appeared poisonous, but being in a botanic garden, I felt safe. But, on second thought, a botanic garden is just a forest with a wall around it. I Googled the snake, and discovered it was not even a little bit venomous. So, I ended up being safe. Kandy is famous for its culture. There are so many things you can do in Kandy. My next stop was the most famous monument of Kandy-Sri Dalada Maligawa (also known as The Temple of the Tooth Relic) located in the Royal Palace complex of Kandy. This World Heritage Site provides the tooth relic of Lord Buddha within a milky white façade with tiled roofs, and is a spectacular site to see. During the evening, I walked to the Kandyan Cultural Centre to see the famed Kandyan Dance. The show starts on a daily basis at 5:30 PM and keeps going for an hour, demonstrating local tradition. I recall the entire building was lighted magnificently and stood majestically. Inside, in the main hall, priests were doing the evening prayers as monks sat meditating. All around, there were intricate wood-carved terraces, balconies, and walls decorated with artwork. As we entered the main chamber, the evening prayers were being offered. Many devotees lined up with offerings of flowers (lotus being the most prominent) among other things. This was my last stop on my short Kandy trip. After that, I took a train and returned home. Sri Lanka is generally warm with the rainy season from May to August. Temperatures can get to 35 °C in June at 75% humidity, and drop to around 16 °C while in the mountains. But, I can hardly name a place where you can encounter that low digits. Typically, November to March is the peak tourist season in Sri Lanka, and prices of hotels are bit higher. Mani Mughal is a 28-year-old an Electrician engineer & newbie travel blogger from Colombo. He loves traveling and meeting new people. His blog has lots of informative articles about Sri Lanka travel to help tourists prepare for their Sri Lanka trips. You can read Mani’s blog here.